Pittosporum tenuifolium 'Tom Thumb' is a compact, bushy, slow growing, evergreen shrub with rounded deep purple leaves which are light green when young. From late spring to early summer, it produces a scattering of small, fragrant dark purple flowers. 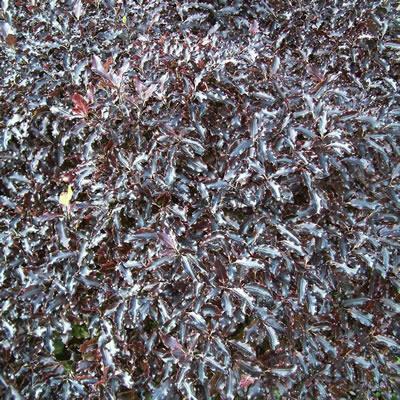 This richly coloured shrub is easy to grow, preferring moist, but well-drained soil and may need protection from cold drying winds. It is best planted in full sun for the best leaf effect, within a flower border, bed or wall-side border and is ideal for the city, courtyard, coastal, cottage and informal style garden. It may also be planted in a container and grown on the patio.